Welcome to the Nest: Lost Pattern Found! Trying to get back into writing crochet patterns again, I came across this pattern that I thought had long been lost! Oh happy day! As amigurumi is made in spirals, do not join rounds. Use a stitch marker or a piece of thread or yarn to mark the end of your rounds. Rnd 16: *sc first 2 st together (dec)* repeat from * to * around. (8 sc) ss in next st and fasten off, leaving a long tail for closing and sewing. Rnd 5: attach new color in any st and work even around (24 sc) ss in next st and fasten off leaving a long tail for sewing. Fold wing circle in half and sew edges together. 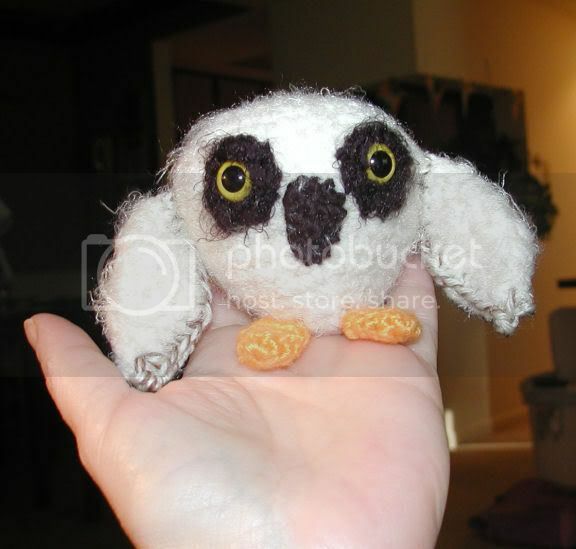 Do not cut yarn, you'll use the remainder to sew the wing onto the body of the owlet. Make 6 sc in a magic ring, join with a ss and fasten off leaving a long tail for sewing eye rings to body. Make 4 sc in a magic ring. Rnd 5: Work even (10 sc) ss into next st and fasten off, leaving long tail for weaving and sewing. Weave yarn through the last row of stitches and pull to close. Flatten slightly to form beak shape. Rnd 5: *sc first 2 st together (dec), sc in the next st* repeat from * to * around ( 6 sc) ss into next st, and fasten off, leaving long tail for sewing and weaving. I find it easiest to sew the beaks and eye rings onto the body before stuffing it and sewing it closed. Referring to photo, sew beak in place, then eye rings. Attach the eye posts in the centers of the eye rings. Stuff the body, and weave the long tail through the last row of stitches, pull tight to close, and sew the tail to secure. Bury thread through the center of the body. Sew the wings onto each side of the body. Fold feet flat, and sew to bottom of the owlet (I placed them at the 3 row from the bottom. It's also easiest for me to pin my body parts into place before sewing them, to make sure they're balanced and in the correct position. If you're not comfortable with using a magic ring, you can also start with the traditional method (chain two and work appropriate numbers of sc into second chain from the hook) but I find it leaves too big a hole for my tastes. That's part of the fun of working with crochet, Susan. When you love to do something, it's not hard to think of cute ways to do it! - We admired this lovely old quilt at the Five Civilized Tribes Museum in Muskogee Oklahoma. Pockets-A-Plenty Bag - This is my latest pattern available in my Etsy shop!